Louisa Mak (麥明詩) recently joined a TVB international cycling event for charity, spanning roads across China, Vietnam, Laos, and Cambodia. 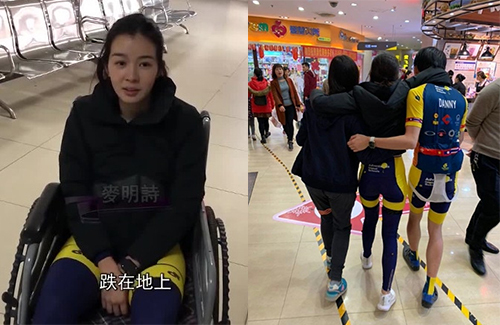 On January 9th, while cycling across a city in Guangxi, China, Louisa lost her balance while maneuvering downhill and crashed into a vehicle. She fell on her left side, sustaining scratches on her left shoulder and elbow. She reported pain around her pelvis, but upon further examination, Louisa only pulled a muscle, and did not suffer any broken bones. Her doctor recommended her to rest for seven days, and not participate in any vigorous exercises in the time being.